Acrylic paint is the newest of the widely used artistic mediums, having been developed for commercial use as recently as the 1950s. It quickly became popular with artists and is now perhaps the most commonly used artists' paint, although it has not yet superseded oil as the most highly regarded medium. Acrylic paint essentially differs from oil paint due to its quick drying time and the fact that it is thinned with water and not linseed oil or turpentine. Its quick drying time is both an advantage and disadvantage. With regard to the former, acrylic is easier to control than oil paint as the paint on the picture surface is not liable to be manipulated accidentally over the course of finishing the painting. Once one area of the painting is painted, it is possible to move to another area, or to over paint it, without worrying about new applications of paint tainting the existing surface. However, with regard to disadvantages, once something has been painted with acrylic, it soon becomes permanent and difficult to change. Whilst it may be over painted, this is makes the painting less flexible than with oil paint, where the surface can be subtly manipulated over time to create nuances of expression. Acrylic paint also suffers as it is not as luminescent as oil paint, tending to dry as flat and dull in comparison. It is also less viscous than oil paint, meaning that is not quite as good at producing impasto, and is less manoeuvrable on the canvas and on the palette. Thankfully there are a great many acrylic mediums that can be used to manipulate the acrylic paint and increase its drying time, luminescence and viscosity. This means that acrylic paint can have the same advantages pretty much as oil, although some may argue that if it is the properties of oil paint that you are after you may just as well use oil: Acrylic is better for work on the move and for work where you want to avoid the mess and paint fumes associated with oil paint. 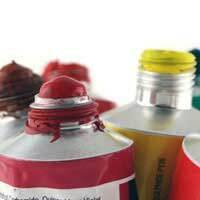 One of the main and overriding benefits of using acrylic paint is that it requires less in the way of specialist equipment and mediums than oil paint in order to get started and that it is a cleaner, simpler medium to use. This has led to its fast rise as a medium, especially for very clean clinical work, where to use oil would hamper the speed of execution. For clear flat planes of colour, such as in paintings by David Hockney (b. 1937) acrylic is ideal as any mistakes made in oil will be harder to reverse in the short term. In its infancy, it is hard to know how acrylic paint will fare over time, but in a time of slick advertising, it may well be an ideal medium to convey our relatively clean and fast times of living. It seems also that as paint is not the essential medium that it used to be, it may seem over luxuriant to use oil paint when acrylic would do in conveying a message.